The 1920s. The Jazz Age. The age when Coco Chanel invented “a mode of brilliant simplicity” (Cecil Beaton), stripping women of their finery and freeing them of the tyranny of corsets and hobble skirts; she was also one of the first women to wear her hair short. The Prohibition era. The decade of decadence and dancing, of fantastic parties, remarkable for representing the true spirit of their time. A time when F. Scott Fitzgerald was holidaying with musicians, writers and artists, like his wife Zelda, Ernest Hemingway, Picasso, Stravinsky and Dorothy Parker, at the French Riviera villa of the American socialites Gerald and Sara Murphy or partying at the Ritz in Paris (Coco Chanel: The Legend and the Life). The Roaring Twenties he embodied in his book of an enduring appeal “The Great Gatsby”: a love story, a story of the power of illusion, a deconstruction of the American dream. 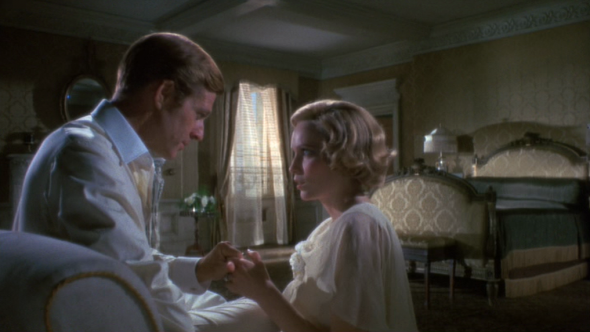 I’m not going to compare the book with the 1974 screen version of The Great Gatsby, because I wouldn’t even probably write about it then, for obvious reasons (but really, how could anyone put on film Gatsby’s greatness which is measured by the intensity of his dreams?). 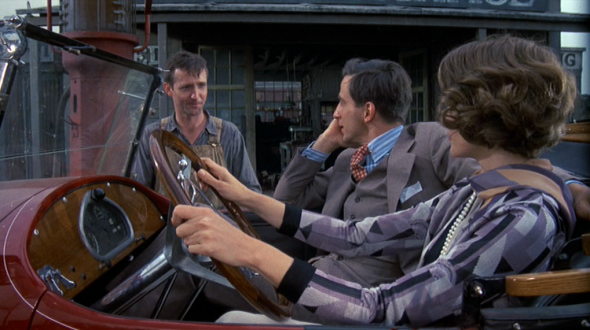 However, the movie did an excellent job in portraying the Jazz Age. 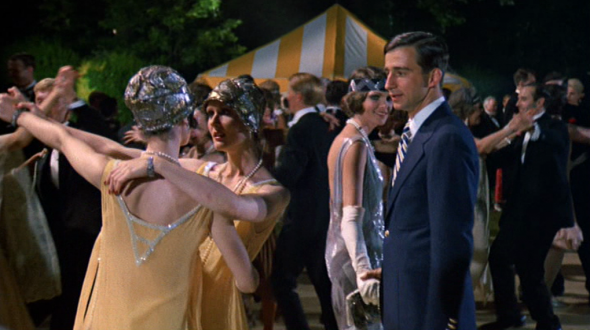 The scenes of Gatsby’s party seemed almost real because of the accurate costumes, the Charleston, the drinking, the dancing and the well trained dancers. 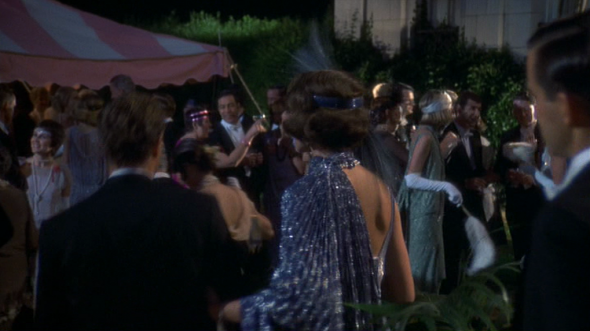 And I’m starting with the party scene as the costumes are beautiful here and it’s the only scene I like what Daisy Buchanan is wearing. 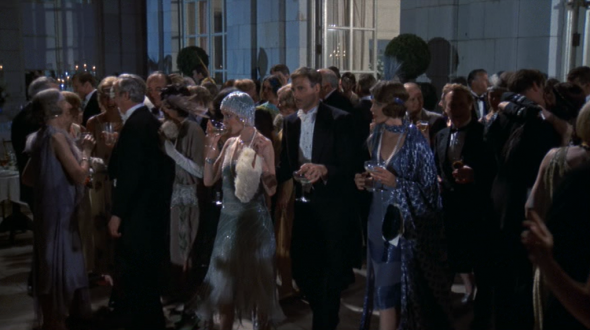 The ’20s fashion is currently enjoying a revival and this is the style of the ’20s that I like. Glamorous drop-waist dresses covered with beads, swaying pearls, Daisy’s shimmering silver fringe dress and jewelled headpiece and Jordan’s backless blue dress, amazing one-shoulder cape and feathered headbend (how gorgeous is her hair style?). I simply love these two outfits. I’m approaching fashion in this film a little differently, meaning that I am going to insist very little on the main female character. 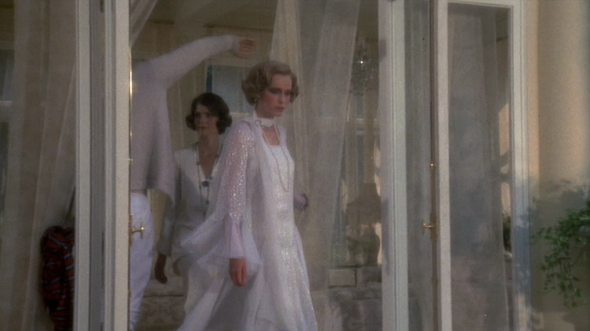 The reason is simple: except for the party scene and the three looks below (the white chiffon dress, the beautiful cape and the detailing on the pale yellow dress), I didn’t quite like them. 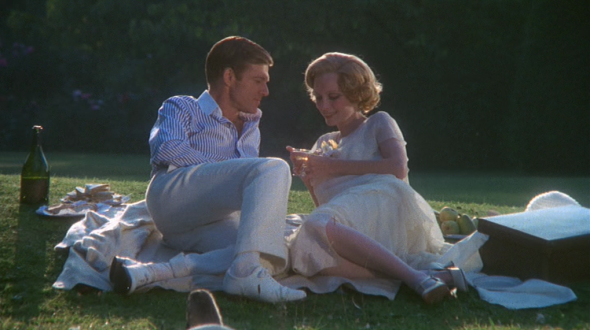 The clothes may epitomize her girlish naïveté, the way Daisy always seems to be cacooned in fabric, a fragile character that could not survive outside the world she’s wrapped up in, but I can’t help thinking that the costume designer could have done better. 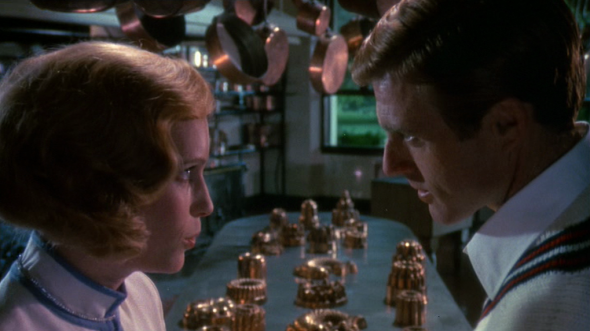 Moreover, I didn’t like Mia Farrow’s portrayal of Daisy: from her high-pitched voice and plain acting to the lack of chemistry between her and Robert Redford, she takes from the book’s character, which can be a little misleading. She was just wrong for the part. Sorry for the poor image above, it’s a transition shot and that’s the way it appears on screen. 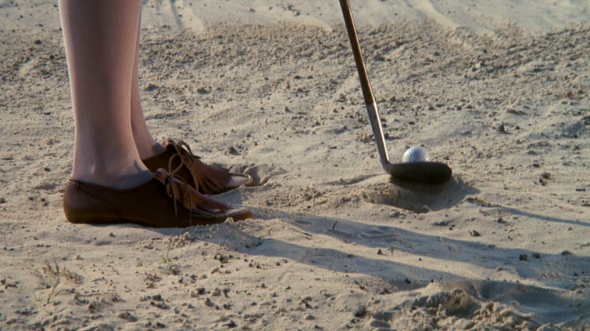 It’s Jordan Baker’s wardrobe that appeals to me. This is the other part of the ’20s fashion that I like, the more masculine look, the androgynous silhouettes that Chanel herself pioneered. 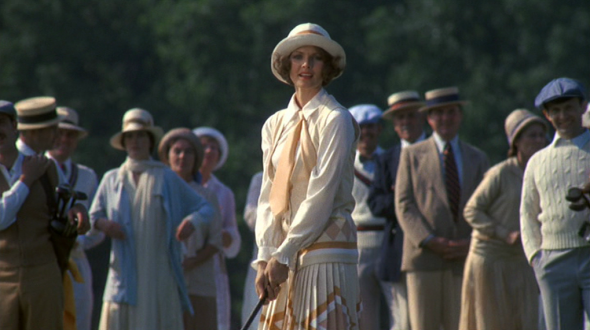 Jordan (played by Lois Chiles) is a professional golf player and her outfits reveal her exuberant, sportive, independent character. This is such a beautiful interpretation of the time’s fashion and the costume designer deserves all the credit for it. 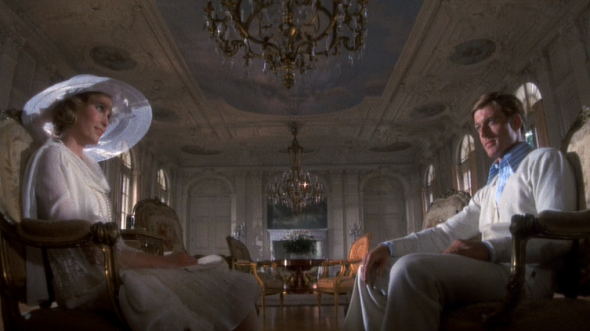 Don’t you love the lounge silk pants suit, the golf gear and gorgeous brogue shoes, yet another headband and bare-back silver party dress with elbow-length white gloves, the graphic day-dress and the beautiful feathered hat? 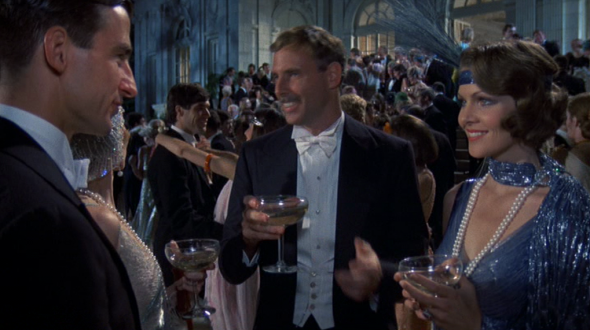 Ralph Lauren consulted on the male leads’ costumes, but he was left out of Theoni V. Aldredge’s Oscar acceptance speech. This is known to have happened with other films and I’ll leave it at that. 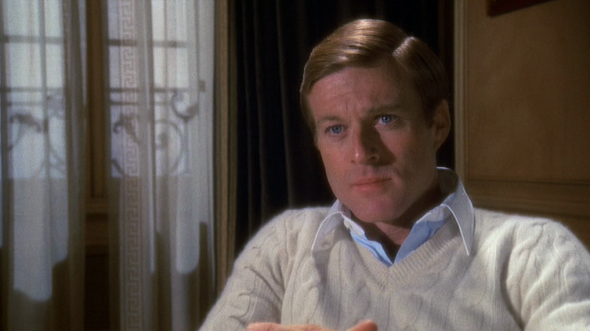 I don’t think that anyone could have done a better job than Ralph Lauren in designing Robert Redford’s clothes. Summer whites, cable knits, beaded sheaths, crisp oxfords, classic tuxedo, striped suits, all illustrating the elegance of the era. 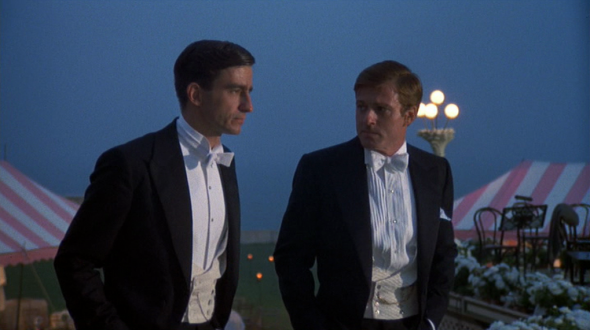 They are so Jay Gatsby, so Ralph Lauren, so American with a classical English influence. 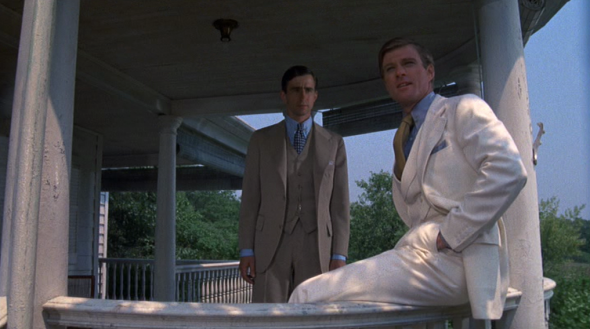 The white suit: who else than Robert Redford could have pulled this off better? 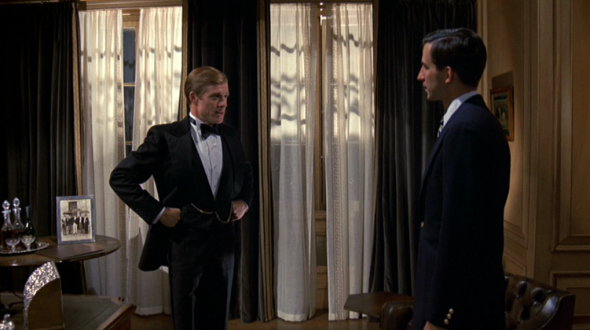 Ralph Lauren showed great talent in designing the costumes, just as much as Robert Redford (with his calm intensity) showed great talent in wearing them. And I’m not referring to the way they fit, but to the way he seems not to be at ease in his bespoke clothes. They are only a means to reclaim his lost love. Everything he does is for love. I love this look, with the silk scarf and blazer. 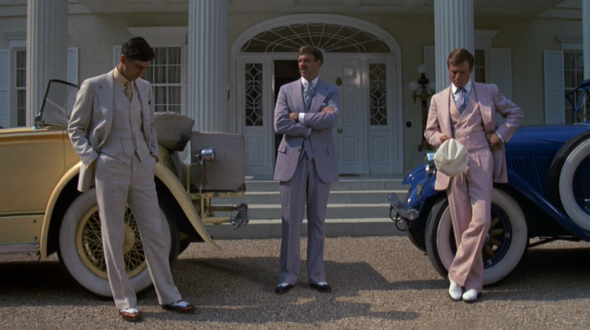 The surprising pale pink linen three-piece suit. 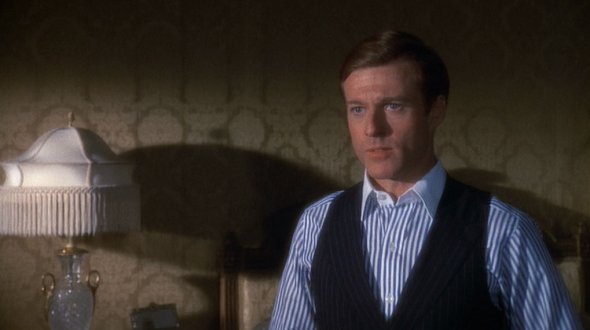 It’s one of the most singular suits in the history of cinema and it’s been much written about its symbolism. 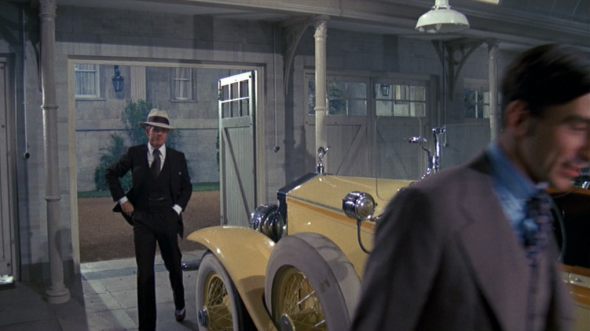 Throughout the film Gatsby is dressed in the fashion of the period, but he wears the clothes in his own unique way, which could not be better expressed than through the use of colour. 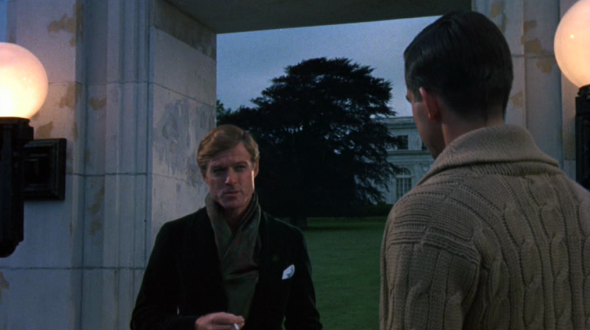 Robert Redford is wearing the pink suit with such conviction, as it’s part of the image of the hero Jay Gatsby invents, the same conviction with which he believes he’s going to win Daisy back. 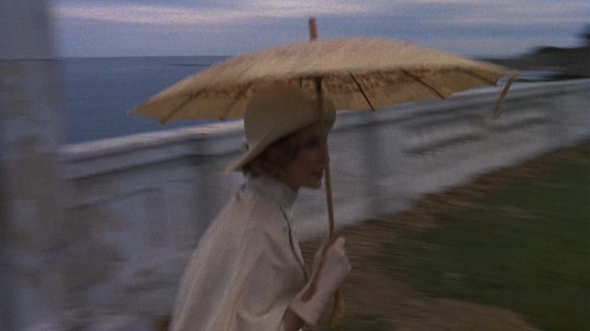 This entry was posted in Style in film . Bookmark the permalink. Sigh, this post speaks to me! As you know already, this is my favourite era of fashion, these costumes make my knees go weak. I should have known that Ralph Lauren was involved, but I didn’t, as I have never read anything about the costumes. Now I just have to watch the film again … and read the book again too. 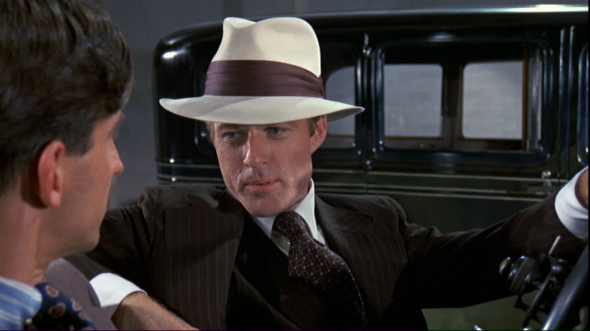 In my opinion, Robert Redford will always be THE Gatsby but I think the young generation will find theirs in DiCaprio. I get the feeling that he has played that role very well and I’m looking forward to see the new version. 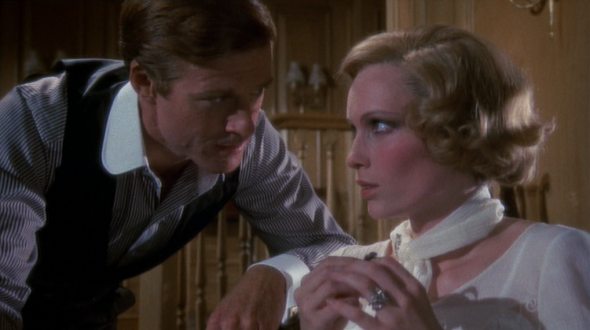 Robert Redford will always be THE Gatsby for me too, Lisa. I am curious though to see Buz Luhrmann’s vision, not that I think that his film will be a more accurate interpretation of the book or that the costumes will be more than a modern interpretation of the ’20s, but because he tells his stories in certain way that I’ve found interesting so far. This is one of the gaps I need to fill in – I still haven’t seen the movie… Your stories are always wonderful and make me learn something new each time. On a different note – don’t the colours and shape of the outfit on photo 10 remind you of one of the recent Chloe’s collections? Yes, Natalia, now that you mention it, that look reminds me of the recent Chloe collections, especially the Spring 2012 one. I have never seen this movie but I have read the book two or three times. I didn’t even know that this version existed! As I like to say to my son the 70’s was one of the best times in cinema, I will have to watch this one. 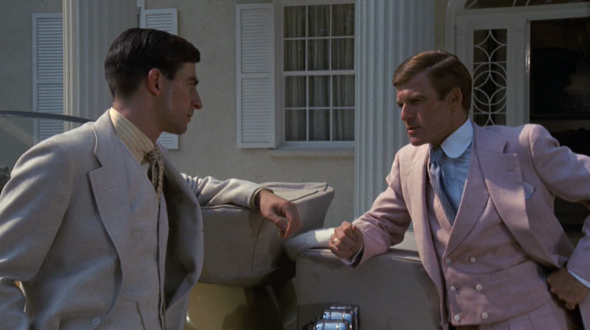 Love the pink suit on Robert Redford! 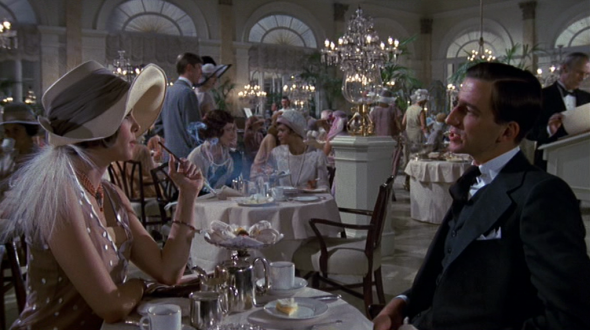 I feel like I need to watch this film again to fully appreciate your enlightening fashion commentary Ada. The 20’s were a lovely period for fashion. What a treat Ada! The Great Gatsby has and probably always will be my favorite book. And I couldn’t agree with you more about the miscasting of Daisy from the 70s version–I always pictured someone more wholesome like a Reese Witherspoon (one day we will have to chat in person about our fantasy casting, ha!). 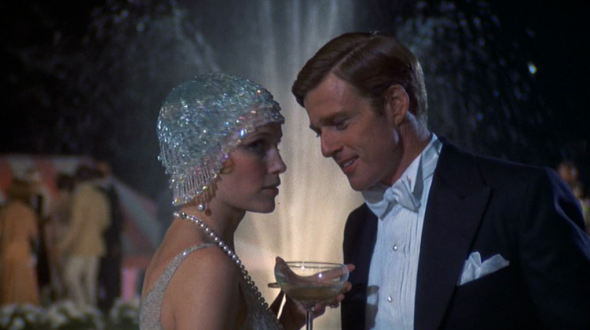 Robert Redford’s beautiful look from the movie though is emblazoned in my mind, and the only other wardrobe he’s ever had that came close was The Way We Were, although not as wonderful nor symbolic as Great Gatsby. 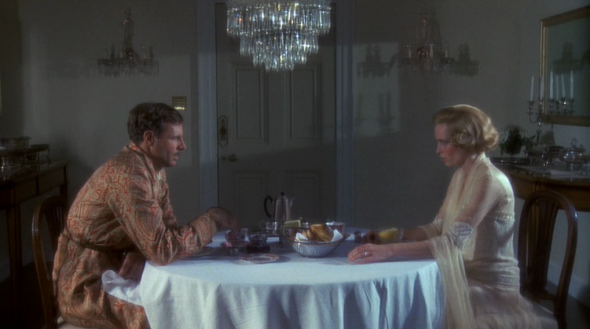 Interesting isn’t it that Louis Chiles is also in The Way We Were–it’s when I first noticed how stunning she is. Will have to read up on the pink suit–somehow I never noticed it before. 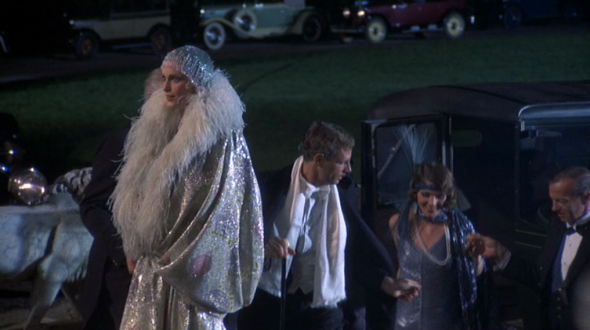 I can’t even handle how much I love the Gatsby fashion!!!! So gorgeous!!! And your right- the men look as chic as the women. I can completely see the RL influence! I love the book. And I am very excited about the new movie with Leonardo DiCaprio. But I am going to watch the classic version first. Absolutely stunning! The costumes for this movie are epic…it makes me even more excited for the new remake coming out! What a fabulous post! 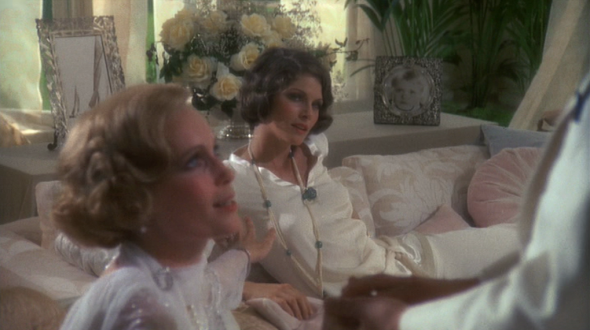 Lois Chiles was so stunning in this movie (she was in The Way We Were too) – I felt she almost stole the scenes from Mia Farrow. 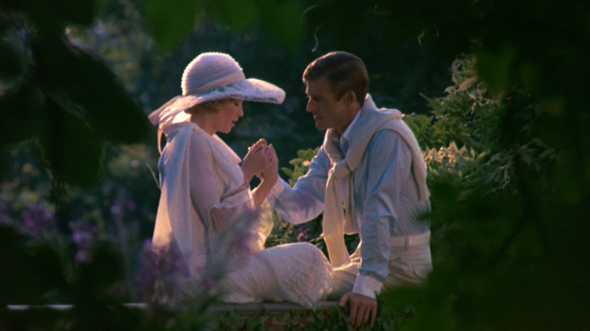 While I have my doubts about Leo’s ability to top Robert Redford as Gatsby, I cannot wait to see Carey Mulligan. So utterly chic! Loving it. Ada, what a beautiful post! I only read the book, but the movie is certainly alluring (not to mention the new adaptation that will soon be released…) You have such a great eye and voice for presenting the fashion and characters of these stories. I was really fascinated by all the details you gave us about both the production and the clothes sported by the main actors. Thank you Ada! MY FAVORITE MOVIE AND BOOK!